I don’t consider myself a social person, especially while I’m in college. I get too focused on school work, and usually meet new people if they are the first ones to come up and talk to me. I was also was self-conscious about people judging me for my English skills. Even though I was born in El Paso, I lived in Juarez, Mexico until fifth grade. And like a lot of others who live on the border, I sometimes felt like I was in an awkward limbo between cultures. Priscilla Judson Wallace, an African-American woman working at UTEP, originally from New York City, quotes the most offensive remark she has heard about her. During the spring 2017 semester I met Hajar Chaffag, an exchange student from Casablanca, Morocco. She is also studying journalism but we coincidentally met on a random group assignment for our performance activism class. After finishing part of the assignment, we talked about a variety of things, including how she went to high school in France, where it was against the law to publicly deny the Holocaust. I asked her how the French perceived how Americans view the Holocaust. This conversation led us to talk about our mother countries, history, politics, travel and the acts of prejudice we have seen inside and outside our countries. She also shared the border culture experience where her home in Morocco is close to Spain, only divided by the Strait of Gibraltar. A lot of Moroccans admire the European culture over that of Northern Africa, she said. In a similar vein it is not uncommon for Mexicans and Mexican-Americans along the U.S., Mexico border to feel judged because they don’t seem deeply rooted in either side. We talked about how Eurocentrism/Western-centrism unconsciously affects some people’s ideals for culture and beauty where they may value designer clothing and lighter skin. As we say in Mexico: Aquí y en China (Here and in China), ignorance and judgement happens everywhere. Ariana Cortez, a Muslim Mexican-American student at UTEP, quotes one of the most ignorant remarks she has heard. The conversations Hajar and I had were helpful in determining our final project, which consisted of bringing attention to a social issue in a public place. We decided to use our journalism skills and interview a diverse sampling of people around campus. 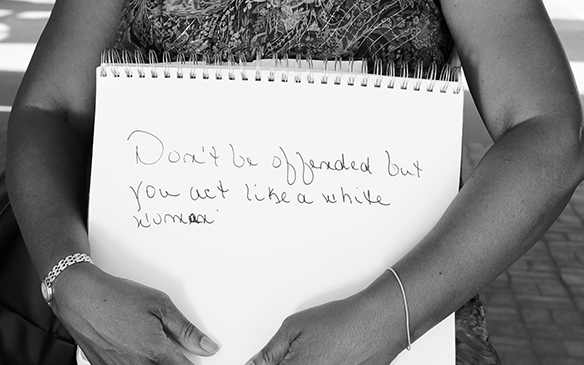 We asked 20 people to write down their response to a question: “What is the most ignorant remark or experience happened to you regarding your appearance/culture/background?” We photographed them holding their written responses. I was struck by how everyone immediately thought of a rude comment or negative interaction over their ethnicity that had stayed with them. The response that I identified with most was from Wansik Oum, a UTEP student from Seoul, South Korea. Oum wrote about how classmates laugh at him when he gives presentations in English. I perfectly understand this experience, which I believe almost everyone who has to learn English goes through at least once, even in our all-inclusive border city. I always thought it was only those of us from Juarez who were humiliated for our accent and word choices in English. When we go through that experience we tend to stay within our small groups because we feel safe and comfortable. If it wasn’t for Hajar, I would of have never understood better those outside my background. The activity taught us to feel equal to those who surround us and appreciative of the people that make UTEP and the border special. Since the Trump era, acts of intolerance towards minorities and immigrants are noticeable more than ever. Still, this is not an excuse for us who belong in a minority to forget to respect those of our ethnicity and other sub-groups. 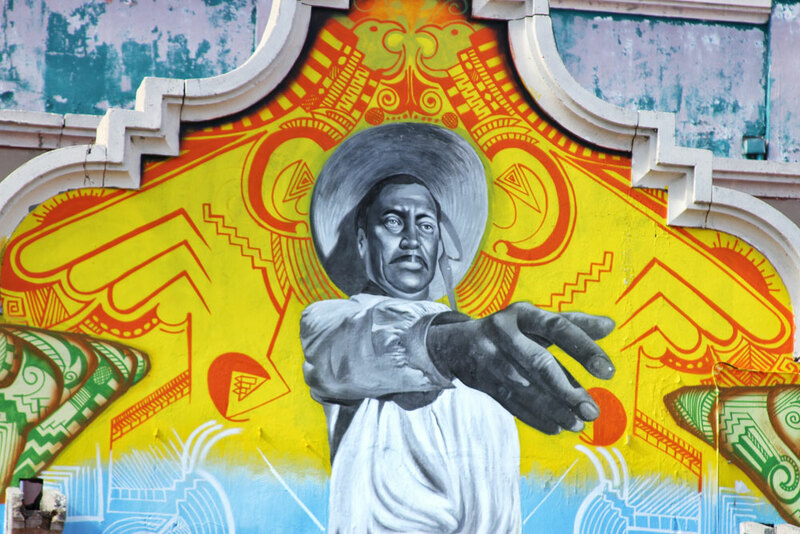 A recent study by the UACJ shows Ciudad Juarez as one of the most racists cities in Mexico. But why does this happen? As I learned from this experience, ignorance and indifference—due to culture shock— can make us unconsciously accept discrimination directed at those outside our ethnic-group, even if these acts do not come directly from us. Now I feel more open to be approachable to anyone. I used to be afraid, always thinking that there were people who know more English than me or have more years here and I haven’t progressed as well. But now I feel empowered realizing everyone feels like an outsider from time to time. I’m more confident about expressing myself and not worrying about what people think. Most importantly, I feel I am more open to talking with other people and genuinely getting to know them for who they are, . Paulette Villa is a multimedia journalism major at UT El Paso.